Although not all exorcisms are the same, the girls carry with them basic kits that include the Bible, a cross and holy water. They make use of these tools to drive away demons from the possessed’s body, while two large men hold him down. 16-year-old Brynne, from Phoenix, Arizona, who happens to be Bob Larson’s daughter, says she has conducted exorcisms on 140 kg, 6ft 5in men and things can get a little dangerous, but luckily none of the girls have ever been hurt. During the procedure, they often get spat at, sworn at and even vomited on, but it’s just all worth it when they finally convince the demons to leave the possessed in peace. 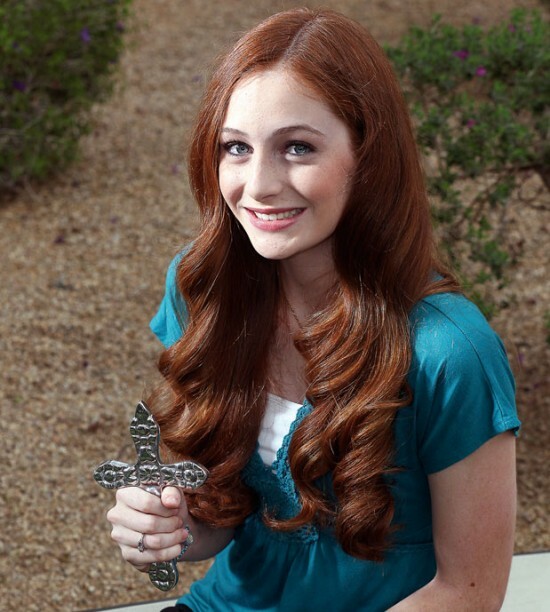 Brynne Larson has been fascinated by exorcism since she was just a child. When her father came home she always greeted him with the question ’What demons did you find today, Daddy?’, and she traveled with him around the world, observing his exorcism skills. At 13, she conducted her first exorcism, in a small African village, and managed to drive the demon back to the pits of hell, earning the possessed man’s gratitude and the cheers of the local crowd. She has conducted many exorcisms since then, but the most important one was on her best friend, who was complaining of headaches painkillers just wouldn’t cure. She had all the signs of demonic possession, Brynne recalls, so she and and another friend took her somewhere private and performed a ritual. After that, her BFF started crying and claimed she was free of her problem. This team of teenage exorcists have accompanied Reverend Bob Larson around the world, helping him battle the forces of evil and bringing peace to the possessed. Larson doesn’t seem to have a problem with them being just kids, in fact he claims that “our female, teenage exorcists are particularly effective at curing the possessed, because they’re so sensitive and very pure,”. But they’re just a small squad of soldiers in his anti-demon army. He says he has 100 teams of well-trained exorcists working all over the world, and they still can’t keep up with demand for exorcisms. Apparently, his Church of Spiritual Freedom gets over 1,000 monthly requests and they’ve travel the world over trying to help everybody. Exorcists don’t charge for their services, but people bring “offerings” and in case of emergencies, like traveling half way around the world, they can incur expenses of up to $4,000.